Make sure to check out all the photos for this month in our September 2015 Fishing Gallery. Catch of the Week: Jeff Spence from Peoria, AZ with a monstrous 8 pound 3 ounce Rainbow. He was using a Nightcrawler while fishing the North Shore. Great catch Jeff! 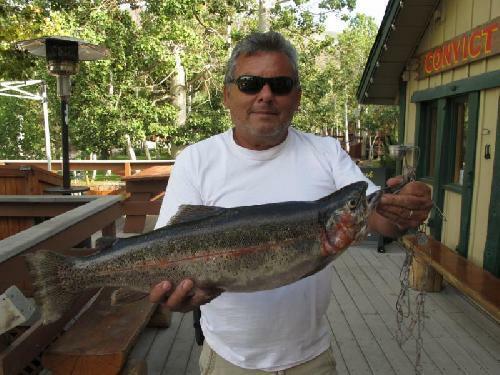 * Skip Trueblood from Lakeside, CA hooked a solid 7 pound 15 ounce Rainbow while fishing near the Outlet. Skip was fishing a Nightcrawler. Kevin Dooley from Santa Ana, CA caught a stout 7 pound 15 ounce Rainbow while fishing the Inlet area with a Tasmanian Devil. * Troy Butler from Forest Falls, CA caught a portly 7 pound 15 ounce Rainbow while fishing at the Inlet. Troy was using Garlic Chunky Cheese Gulp. * Bryce Walker landed a hefty 7 pound 6 ounce Rainbow using a jig. Bryce was posted up at the Inlet. Keaton Propps from Palmdale, CA caught a fat 6 pound 15 ounce Rainbow. He landed it at the Inlet while fishing with a Gulp Pinched Crawler. Freddy Jaramillo from Los Angeles, CA hooked a 6 pound 7 ounce Rainbow. Freddy was using a Nightcrawler while fishing along the South Shore. 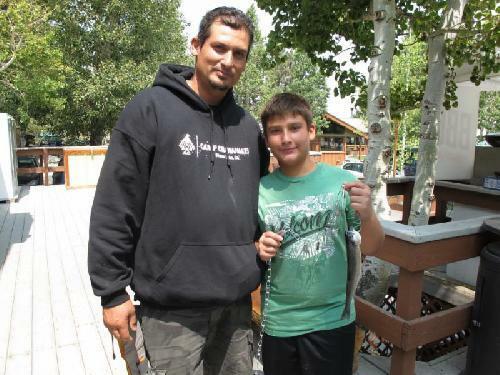 * Carlos Sanchez from Palmdale, CA landed a 6 pound 7 ounce Rainbow with Green Powerbait. Rudy Samkow from Arcadia, CA with the Convict Lake hat trick. He caught a 3 pound 5 ounce, 5 pound 4 ounce and a 5 pound 11 ounce Rainbow. Rudy was using a Nightcrawlers and was fishing near the Inlet. * The Suzuki Family of Kahului, Maui traveled the farthest to get on the fishing report. They filled up their stringer by using Powerbait while fishing at the South Shore. Tactics/Bait: There are a lot of options when it comes to tackle. The last two weeks a variety of different tactics were working. For the anglers that prefer casting lures I'd start with a Red/Gold or Frog pattern Thomas Buoyant. Other lures that were working include Rapalas and Tasmanian Devils. 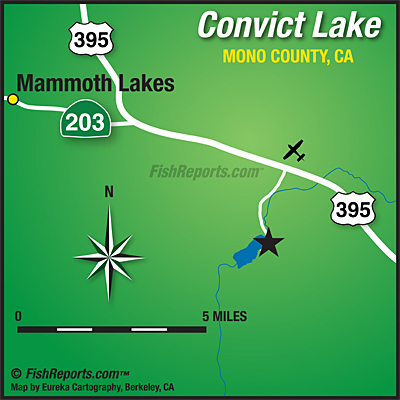 If you are going to troll any lure you will need to get down about 50-60 feet. For the anglers that like to toss jigs, Fall is always a good time to do so. People that tied on either a Gulp Pinched Nightcrawler, Berkley Mice Tail or Berkley Worm rigs landed quality fish. If you are thinking about bait fishing you can't go wrong with Inflated Nightcrawlers, Salmon Eggs or Powerbait. Over the last two weeks a number of Powerbait colors were hooking up. The top colors were green, salmon peach, yellow, chartreuse and chunky cheese. Any garlic Powerbait continued to drive the fish crazy. Some of the most productive spots on the lake were the Inlet, the Outlet/Jetty area and the South Shore. The "Catch of the Week" was caught along the North Shore. Other locations to try would be the North Shore down to the Inlet and Hangman's Tree. Sierra Slammers, Tasmanian Devil, green or brown Marvel Flies , Trout Teasers, Panther Martin, NeedleFish, Rooster Tails, and Bite-On Fury Shad on Powerbait. I would suggest using some type of added attractant. Pro-Cure, Bite-On, Lip Ripperz and Berkley all make excellent attractants, which are sold at the general store. Derby News: Running now!! The Ambush at the Lake Fishing Derby runs September 7th - November 15th. Don't miss out on a chance to win $6,000 in Resort Prizes! The Morrison Bonus Cash Weekend will be October 30th - November 1st. $2000 in cash prizes! Weather: The smoke has diminished greatly after some rain early this week. The Rough Fire is reportedly 70% contained. The forecast is calling for continued sunny skies and clear at night for the beginning of the week. The high temps for the start of next week will be in the low-70's and the lows in the mid-40's. Here is the National Weather Service link that is usually quite accurate: 7-Day Forecast Convict Lake.